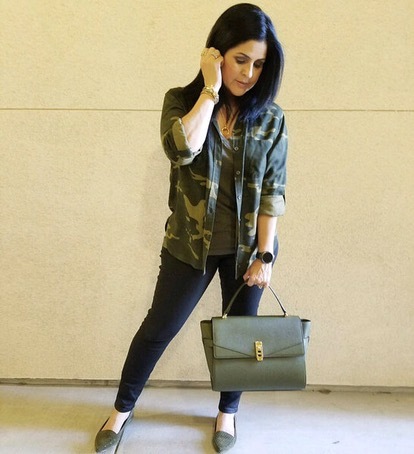 CLICK HERE>>SHOP THIS LOOKLoving this Military Green Henri Bendel Uptown Satchel. It is a fabulous Fall Color! Handbag was such a hit, it is sold out. I did find like Satchel. Similar color that would go well with this look. This button up from Express Camouflage button-up has an amazing fit. Love it!! High-low boyfriend Shirt. Madewell military green whisper cotton tee has been my favorite tee's. They come in a variety of colors. I have collected all colors. Dolce Vita Pointy Studded Flats were from Nordstrom Rack and are sold out. I did find some like pointy flats by Sam Edelman. Joes Jeans coated skinny jeans are amazing. I bought mine a year ago and they have held up well. Fits the curve very well. I have 3 different styles I have listed to choose from. If you shop this look, I would love to see a pic!